The final currently known Pulham site in Scotland is Dunira, near Comrie, in Perthshire, of which very little now remains. 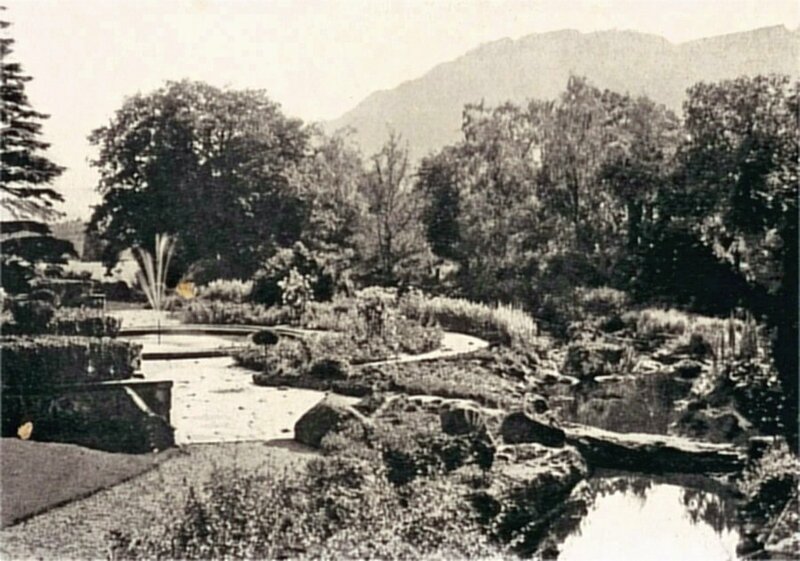 Like Mount Stuart – see Site of the Moth #50, Jul 15 – these gardens were designed by one of the greatest English landscape artists of all time, Thomas Mawson, and they were also one of the very few gardens constructed by James Pulham and Son after the First World War. 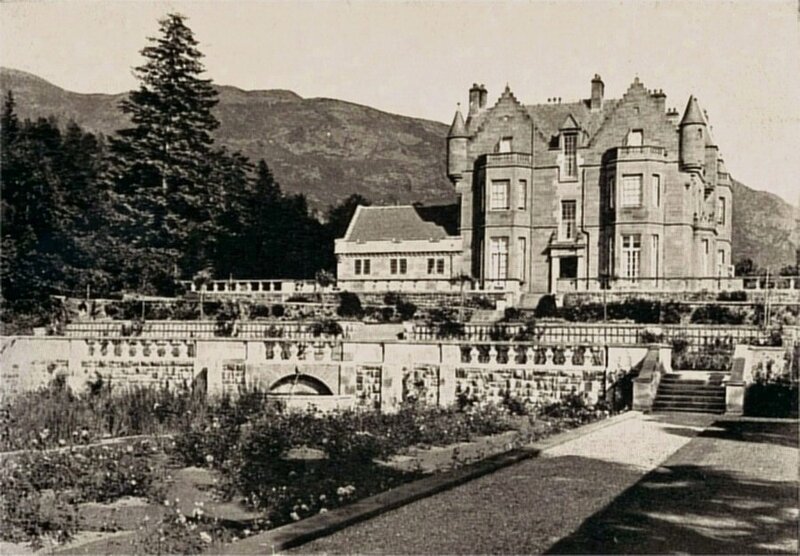 Douglas Macbeth Munro – a wealthy Clyde shipbuilder during the First World War – purchased the Dunira estate in 1919 as a wedding present for his son, William Gilchrist Macbeth. William immediately re-developed parts of the estate, and commissioned Mawson to create terraced gardens around the house. ‘The beginning of 1920 marked further progress in the post-war reorganisation of the practice. Old members of the staff resumed to their accustomed work, and pupils whose studies had been interrupted returned to complete their course of tuition. Old clients looked out their progress schemes, and new clients for both public and private projects were filling the office with interesting work. . . .
‘Dunira is one of the most beautiful estates it has ever been my pleasure to study. The park, which extends to many hundreds of acres, is perfectly level, and the soil a rich alluvial deposit. Out of this plain rises somewhat precipitously a number of high mounds which suggest that these were at one time islands and promontories rising out of a lake, much in the same way as Windermere and its islands; in fact, when mist lies over the park it is easy to imagine a large lake studded with wooded islands. Beyond these islands are forest-clad mountains which completely encircle the estate, but at such a distance as to create an aspect of spaciousness. This encircling range of mountains reminded me of Grasmere as seen from Dunmail Raise, only they were even more picturesque in their rugged outlines and towering peaks, whilst everywhere the slopes and foothills were clothed with timber wherein groupings of Scotch firs gave a massive effect to the whole. . . .
‘The house was very large and well placed on the site, but although describable as Scotch Baronial, it was not built in a fortunate period of architectural taste. The architects, recognising its shortcomings, and backed by a generous client, prepared designs which brought the whole into harmony with Scottish traditions. These additions, mostly on the north side, comprise a spacious porte cochere on the centre line of the carriage court. This carriage court, which is now a feature, is framed in on the west side with the new billiard-room and on the east with the new kitchen wing. 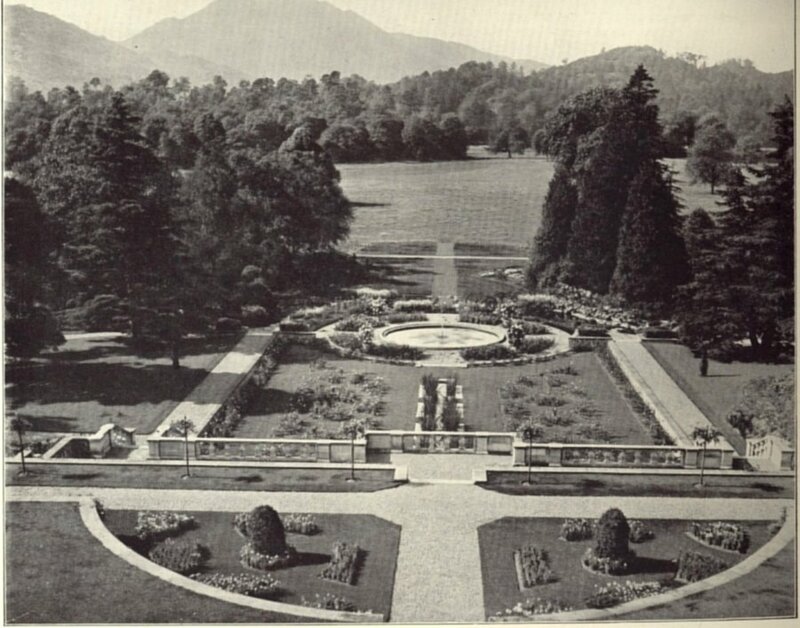 ‘Originally what passed for the gardens was a number of uninteresting grass slopes, unrelieved by flower bed or shrub, to all appearances arranged by a waterworks engineer with railway experience; all excepting the precipitous bank, which was the unfinished margin of the original lay-out, had been roughly planted with yew, hollies and timber trees, making a ragged outline across the southern view. On the northern side of the garden, and for a depth of about one hundred feet from the line of the drive, trees and shrubs, including many rhododendrons, had been planted and formed a pleasing foreground to the forest heights which rose on the opposite side of the drive. The walled-in kitchen garden was situated about half a mile west of the house, and near it were the stables, garage, gardeners’ and workmen’s cottages and bothies, which are now transformed into a very picturesque, well-planned group. ‘My instructions were to design the gardens, in both their character and extent, as I would like to see them. In the main, these original plans have been followed, the only important omission being the panelled rose garden, by which we proposed to limit the west of the gardens where they join the park. We still hope that this feature, with slight modifications, may be carried through. In our designs we included the improvement of the fruit and vegetable garden and the erection of one of the most complete and extensive ranges of fruit and plant houses and accessory buildings I have ever planned. ‘Beginning near the house, we proposed first of all to improve the approaches and extend the carriage court on the north side; then we endeavoured to secure an architectural base to the house on the west and south, by erecting a balustraded wall to take the place of the grass slope, providing ample width of steps to lower ground. ‘The remaining grass banks were replaced with retaining walls built of local black whinstone without mortar, the crevices being filled in with Alpine and rock plants. Flowering shrubs suitable for covering low walls were planted at intervals to break up the long lines of the masonry. ‘The long and very deep bank on the south front was entirely re-formed with diagonal walks rising from the upper bastion to the centre of the bank, then returning to the centre formed by the tea house, thus securing a convenient means of connection between the house and the six tennis courts (four green and two hard) on the lower level. ‘On the west side one of the most interesting features is the rose garden and lily pond, the pond fed from a wall fountain by way of a narrow canal which was constructed with a number of side recesses, planted with iris and reeds. The feature my client most appreciated is the rocky stream which enters the gardens to the north and passes southward beyond the line of the rose gardens until it loses itself in the artificial lake below. The rock-builders were fortunate in having to hand an abundance of picturesque moss-grown rocks, which they handled with great skill, to construct the cascades, pools, and the Alpine gardens. In this work we had the able assistance of Mr. Pulham, who continues the sterling reputation of his father and grandfather as rock-builders. This is a realistic assessment of the fact that our garden heritage can only remain intact if a large number of interested people are prepared to devote of considerable amount of energy and hard work towards its restoration and preservation. The Heritage Lottery Fund may be able to help, but it can only do that if it is backed up by the support of local people and their Council representatives. Scotland contains some good examples of the various garden styles with which James Pulham an Son were involved over the years, and of how their work has fared as a result of varying levels of care and attention throughout their lifetime. Posted on September 1, 2015 June 4, 2016 by Claude HitchingPosted in Sites Month 2Tagged . . James Pulham and Son, Douglas Macbeth Munro, Dunira - Comrie, Sir David Dundas, thomas mawson, William Gilchrist Macbeth.